Peter Laird's TMNT blog: Thanks, Isaac! 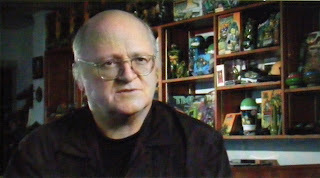 This image of me is from the interview footage done a few weeks back for the upcoming TMNT fan documentary (http://www.turtledoc.com). I asked the man behind the documentary, Isaac Elliott-Fisher, to send me a copy of the raw interview footage, and I just got it a couple of days ago (along with a copy of his other documentary about Toyota Land Cruisers and a t-shirt for that documentary). Darn, someone stole my idea! Oh well, I can't wait to see it. PL - you have to install a program like DVD Capture to take a screenshot of a dvd playing on a Mac. Or just download Power DVD 8. No one should leave home without it :). Hey Peter, I've been asked by one or two people if I had any questions for you regarding old school TMNT, and I think I've about exhausted 'em. But I do have one for new school TMNT, considering the sneak peak of tommorows ep. How did the development of Casey's Mom come about? I always found her a cool/fun character since her first 'true' appearance in the HATE episode, and sort of wished she was around more. I especially want to know how she managed to spot Leo and Splinter hiding off in the shadows :). -->> Issac's the man !! With tomorrow's episode being the finale, what's your final thoughts on the show? Personally, it's gonna be hard to go through a bout of no turtles on TV for a while... But at least now we've got the internet and youtube to cure the withdrawals! And, when you look at the series and the incredible plotlines and characters created by Lloyd and his amazing team... I do hope you'll be keeping in touch with them with any possible future endeavors? If you do talk to Lloyd at some point soon, do let him know he and his crew gets a big thumbs up from THIS fan. How did the development of Casey's Mom come about? I always found her a cool/fun character since her first 'true' appearance in the HATE episode, and sort of wished she was around more. I especially want to know how she managed to spot Leo and Splinter hiding off in the shadows :)." I think we based Casey's mom a little bit on how she was when she appeared (briefly) in the Volume 1 comics, I believe near the end of "City at War". Kevin and I didn't explore her character too much, but I recall we made her a kind of feisty, no-nonsense woman. Amy, thanks for the kind words, and I sure Lloyd will appreciate them, too. Don't get too bummed about the show ending everyone, there is still the direct to DVD project that sounds very promising from what I've heard. "I feel like I was finally able to contribute to a TMNT animated series which captured the spirit and essence of the TMNT comics (with some small concessions to broadcast standards and practices)." Concerning any future TMNT animated series, will you be looking to continue adapting stories from the Mirage comics or create a new direction with more original stories? I thoroughly enjoyed working with Lloyd and his crew, and hope someday to work with him again, even if it's not on Turtles. Have you and Lloyd discussed creating and working on any new non TMNT projects? And will Mirage now look to fund Direct to video projects, now that Mirage is no longer funding a tv series? Concerning any future TMNT animated series, will you be looking to continue adapting stories from the Mirage comics or create a new direction with more original stories?" "Have you and Lloyd discussed creating and working on any new non TMNT projects?" "And will Mirage now look to fund Direct to video projects, now that Mirage is no longer funding a tv series?" I am really excited with this TMNT Documentary. In terms of the 2k3 series, I enjoyed it alot. Even my friends in Hong Kong were excited with the style and story. I really hope that the TMNT show can continue and adapt stories from the Mirage comics. I believe the show have finish Vol.1 story and would be moving to Vol.2? the documentary idea is simultaneously awesome and weird to me. weird because I vividly remember the first day I took my copy of the first turtle comic to my Catholic grade school(after coloring in the first page, of course, and giving the turtles pupils) and watching my friends' eyes bug out of their head. was that really 25 years ago? wow. Awesome because, well, the turtles rule. -->> magnaben , ..your little story is so damm cool !! Catholic Grade School seemed to to be the era for TMNT exposure for me too. Ya turned out OK , Kicker !~! ! !